Ever expanding and re-inventing himself musically, the addition of horns (trombone and trumpet) find there way next to pedal steel, organ, and piano. This isn't your usual pop record, though Pete Krebs isn't your usual pop artist. Incorporating country, rock 'n' roll, and even some punk rock spirit into the pop hooks, his forthcoming album entitled SWEET ONA ROSE (Cavity Search Records) not only breaks out of the alt-country pigeonhole in which some might classify it, but also treads away from typical pop-rock. Pete Krebs credentials are impeccable. Fronting one of the best bands ever to sign to Sub Pop, Hazel, in the early 90's, Pete made a name for himself with sharp hooks, down-to-earth lyrics, and a piercing rock attitude that was only matched by a few at the time. Garnering MTV exposure through Hazel videos, it was only a matter of time before Hazel ran its course and opened the doors for Pete to express himself in a solo atmosphere. In 1994, while still very much active in Hazel, Pete Krebs introduced audiences to his folk-country solo material through a 7" split with another rocker-gone-folk solo artist just starting up, Elliott Smith. 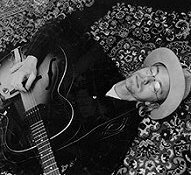 By this time Hazel was near the end of its life and Pete was deeply emerged in his solo career, among other projects like his rockin' bluegrass outfit, Golden Delicious. This led to 1998's split release between Golden Delicious (now defunct) and Pete Krebs. Once again, Pete was able to expand on his solo material with the use of a violin. Never recreating the same material on any album, each one is a new experience that offers up a significantly different feeling than its predecessor. Thus is the case with Pete Krebs and the Gossamer Wings' forthcoming album, SWEET ONA ROSE, due out in stores in April. But what makes Pete Krebs and the Gossamer Wings so special is not just the power of the music, but the people who make it as powerful as it is. Pete Krebs has assembled some of the finest musicians in the area to back him. Bringing in the well-respected John Moen to handle drums, organ, and backing vocals, as well as Soundgarden's ex-bassist Ben Shepherd, area legend Bill Kennedy on lead guitar, and Richmond Fontaine's pedal steel player Paul Brainard, Pete is able to take his songs to the next level. The concept behind the Gossamer Wings is also a breath of fresh air. "I want to be able to play as a rock four-piece one night and the next play with a string section," explains Pete on his ideas for the band. "It is a revolving line-up, so there will always be fresh blood pumping through the band." With a trip to SxSW, as well as regional gigs leading up to the release of the album in the immediate future for the band, plans after the release are still up in the air. "I'd like to tour," says Pete, "but we'll just have to see what happens after SxSW."